They don’t come much bigger and stronger than Pete Hart, but the Highland Games athlete finally met his match when he faced off against Hamish the Highland Coo Van in a tug o’war. 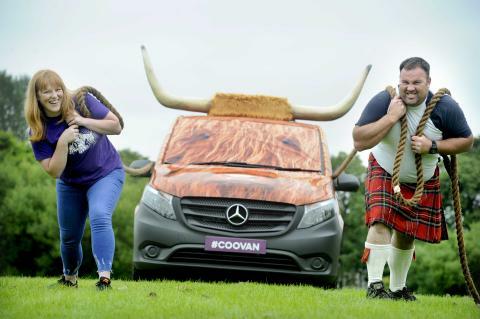 The 6ft 6ins, 25 stone strongman was at the Royal Highland Showground in Edinburgh to help VisitScotland promote the work of its small herd of mobile information centres, which will be appearing at a number of Highland Games over the next few weeks. 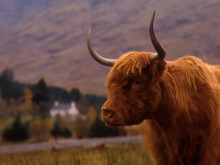 One of the coos: Hamish, Heather, Morag or Archie, will be seen at the Bridge of Allan Highland Games on Sunday (6 August), the Crieff Highland Gathering on 20 August and the Braemar Gathering, which is regularly attended by Her Majesty the Queen, on 2 September. 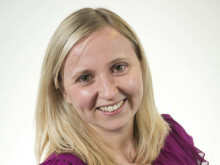 Pete was joined in Edinburgh by Katie Bell, one of VisitScotland’s eight specially trained coo-visors, who are responsible for steering the coos around the country over the summer. 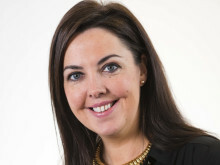 Since hitting the road at the end of March, members of the national tourism organisation’s friendly fleet have been spotted at 23 events across the country, including the UCI Mountain Bike World Cup in Fort William, the Royal Highland Show in Edinburgh, Crail Food Festival in Fife, the Scottish Traditional Boat Festival in Portsoy, Aberdeenshire, and at Glasgow Mela. They have also been at more than 125 different visitor attractions, partner sites and tourism hotspots on a day-to-day basis and will appear at many more before finishing up for the year in early November. 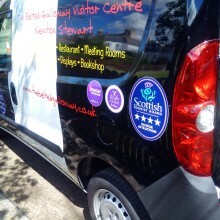 The vans are part of VisitScotland’s strategy to provide inspiration to visitors in new and innovative ways and in doing so extend a ‘personal touch’ to outreach marketing activity, passing on distinctive information about things to see and do throughout the country.